An endophytic actinomycete strain SKH1-2 isolated from Musa (ABB) cv. 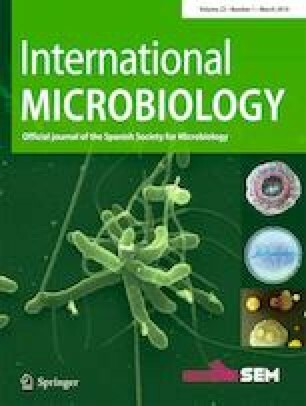 ‘Kluai Sao Kratuep Ho’ collected in Suphan Buri province (14° 54′ 22.5″ N/100° 04′ 50″ E), Thailand, was identified as Streptomyces pseudovenezuelae based on phenotypic and chemotaxonomic characteristics, and 16S rRNA sequence analyses. A chemical investigation led to the isolation of two polyketide molecules from the n-butanol crude extract of the strain SKH1-2 culture broth. The compounds were purified using various chromatographic techniques and identified using spectroscopic methods compared with earlier published data. Compound 1, chartreusin, is known as an anti-Gram (+) bacterial compound and was active against Bacillus subtilis ATCC 6633, Kocuria rhizophila ATCC 9341 and Staphylococcus aureus ATCC 6538p with MIC values of 3.1, 1.6 and 12.5 μg/mL, respectively. Compound 2, lumichrome, did not show activity against all tested microbes. To our knowledge, this is the first report of chartreusin and lumichrome isolated from S. pseudovenezuelae. Taken together, it could be proved that Thai plant species are valuable reservoirs of interesting endophytic actinomycetes producing several interesting biologically active compounds. We faithfully thank Dr. A. Matsumoto, Dr. K. Nonaka, Dr. Y. Asami and Mr. M. Watanabe, Department of Drug Discovery, Kitasato University, for helpful the antimicrobial activity assay. We thank the 2015 Royal Golden Jubilee Ph. D. Programme as a scholarship to N. K. for financial support under the Thailand Research Fund.